iChrome’s software solution Nexus has been instrumental to Vortice ® (1), a leading brand in the production and marketing of air treatment products, to speed-up preliminary product design and to achieve better performances. An overall improvement of 15% on the air flow has been achieved compared to the starting design. This application shows the main advantages of CAD/CAE software integration methodologies to optimize the complex shape of a diverter. These methodologies have been used in the preliminary design phase within Nexus, our design process integration and optimization suite in order to identify the optimal configurations. The diverter consists of an internal component of circular shape and an external one, made of two separated arcs. The diverter is inserted inside an air duct. A filter and a heat exchanger are placed downstream of the diverter. An optimal diverter works spreading the flow as wider as possible on the footprint on the filter without introducing excessive load losses (and noise) in the system. The basic idea here is to use a Nexus to drive a parametric CAD so for to automatically regenerate the geometry of the parts. The new geometries are thus cascaded to a CFD software to estimate performances. Nexus closes the loop so that CAD parameters are changed in order to maximise CFD performances and to satisfy user-defined constraints. boundary conditions for defining the numerical problem remain valid for each analyzed configuration. Clearly such an approach requires the CFD modeler to be able to re-generate the mesh and to re-assign the boundary conditions via a semi-automated macro approach so that a new CFD model is prepared everytine a new CAD geometry is used. The aim of this work is to ensure the uniformity of the flow at the output section of the diverter, while minimising the loss of pressure. The Standard Deviation of the normal component of the velocity vector at the filter section was used as a flow uniformity indicator. Additional constraints are applied on the geometry, by constraining the range of variation of the CAD parameters so to achieve only manufacturable and cost-constrained solutions. Nexus turned out to be particular effective in doing that thanks to its restriction constraints. For the problem under review, these restrictions are particularly convenient. 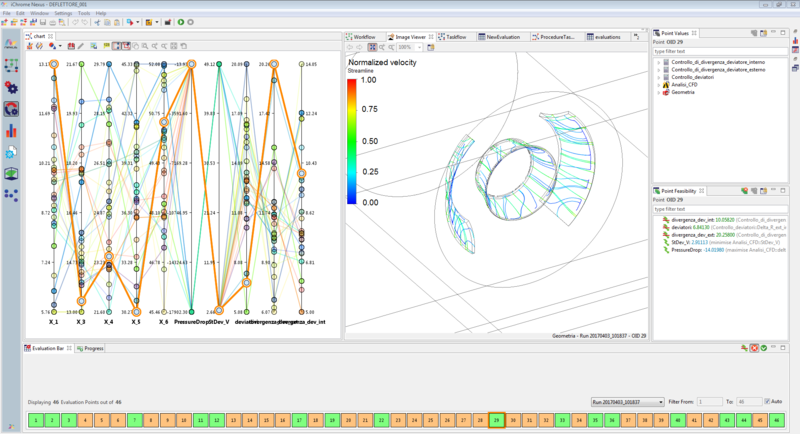 Restriction constraints, unlike traditional ones, allow you to discard the configurations that do not meet the requirements up-front, without performing any CFD analysis, this allowing to save between 30% t0 60% of the overall computational time. The optimization problem was tackled using the Multi Objective Genetic Algorithm (MOGA) of Nexus, the implementation of which is derived from well-known NSGA-II. The optimization process has been monitored in real time thanks to the Nexus Design Explorer module, which enables real-time monitoring of analysis, control and display of results. Convergence was reached with 279 CFD evaluations leading to a Pareto front of about 40 individuals, each evaluation requiring an average of 1.5 hours of wall-clock time on a workstation with 4 CPUs. Given the demand for hardware and software resources needed to obtain the solution, the scheduling features offered by Nexus were used. These madde possible to schedule and change in real time the number of CFD simulation running in parallel – using full resources over-night and freeing up resources for the day-to-day task during the day time. Two solutions belonging to the Pareto set are analysed in detail: the first is best-performing in terms of uniformity of the airflow on the filter section, the second one is best-performing in terms of load losses. Below their main characteristics. 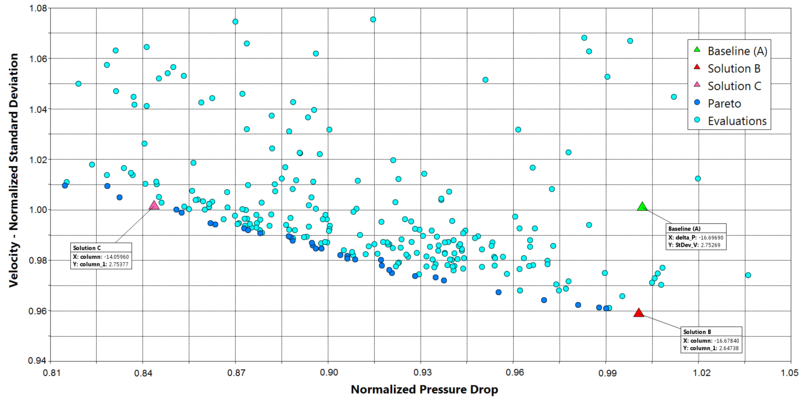 Configuration B shows pressure drops comparable with the starting configuration (i.e. Configuration A), but guarantees greater uniformity of the flow at the filter section, with an improvement of 10% of the difference between maximum and minimum flow rate on the filter inlet section. The work focused on the use of CAD/CAE integration methodologies, to automate the generation of the calculation grid of a CFX model, as a result of changes in the SolidWorks parametric geometry. The aim was to optimize the uniformity of the flow, while minimizing the load losses due to the presence of the diverter itself. Compared to the traditional design paradigm, which generally envisages a manual iterative process, the automated process herein proposed allowed to analyse and rigorously compare many more configurations in a fraction of the time. Among the range of the identified optimal solutions, tow have been selected for further assessment and re-design activities. (1) Vortice® is a leading brand in the production and marketing of air treatment products. Improving the quality of life also means improving the quality of the air we breathe. Vortex was created to design and distribute ventilation appliances, which allow to heat, refresh, change and purify the air of the enclosed places where we live or work. Combining design and functionality, vortex products dedicated to ventilation treat the air efficiently and safely, respecting the environment and people. To pursue these purposes, vortex makes extensive use of advanced engineering technologies and solutions during the design and verification of its products.